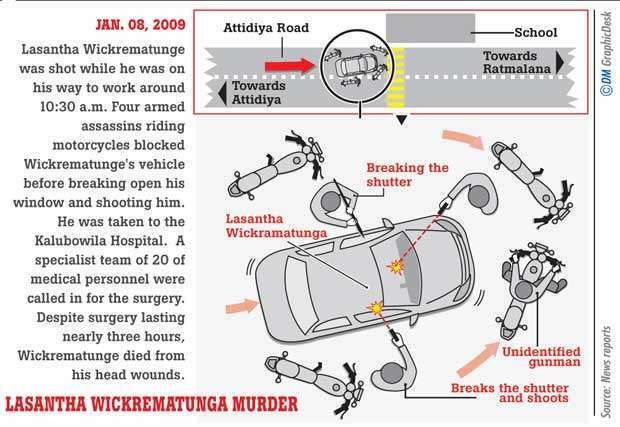 The key technical evidence presented by the Criminal Investigation Department (CID) to the Mount Lavinia Magistrate Court in connection with the investigations into the 2008 abduction and assault on Senior Journalist, former Deputy Editor The Nation newspaper Keith Noyahr and the 2009 murder of Editor-in-Chief of The Sunday Leader newspaper LasanthaWickrematunge was originally gathered prior to the 2015 change in Government, according to former Defence Secretary Gotabaya Rajapaksa. Speaking to the DailyMirror last week, Rajapaksa recalled that the records of telephone conversations and other evidence were unearthed during their time (Government). According to Rajapaksa, immediately after these incidents, they were able to unearth all this evidence. He further said that he ordered all the intelligence agencies to conduct investigations to identify the perpetrators. He specifically recalled doing so in connection with the murder of Wickrematunge and the abduction and assault of Noyahr. 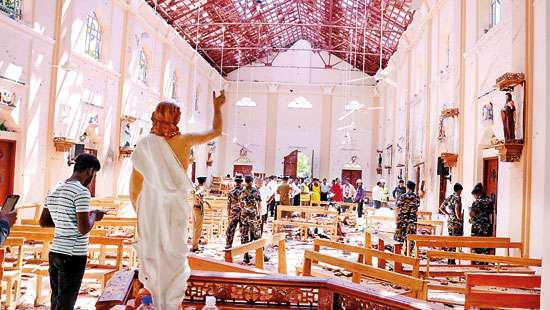 Referring to the current leadership and investigators conducting these inquiries and investigations into other attacks during the previous regime, Rajapaksa accused the CID officers of trying to show that this evidence was found by them. “They have found nothing. These are all what we found. They are manipulating evidence we found,” Rajapaksa affirmed. Rajapaksa also said that despite he himself having personally ordered the investigations that led to the initial gathering of the evidence now being presented by the CID to court, the CID was using this evidence to make arrests and is now trying to coerce those who were arrested into wrongfully implicating him in order to earn their freedom. “They are arresting them and telling them that if you say Gotabaya Rajapaksa’s name then you can get out,” the former Defence Secretary charged. CID Director Shani Abeysekara provided a brief statement in response to questions in this regard from the Daily Mirror. “The CID does not comment on ongoing criminal investigations. All material findings are reported to the court of law with appropriate jurisdiction as provided for by the Code of Criminal Procedure Act. Most of the time, facts so reported to court are part of the public record. 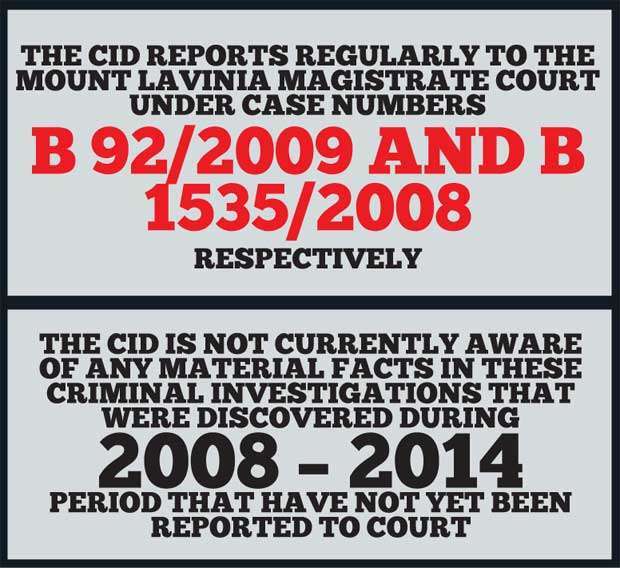 Regarding the investigations on the murder of Mr. Lasantha Wickrematunge and the abduction of Mr. Keith Noyahr, the CID reports regularly to the Mount Lavinia Magistrates Court under Case Numbers B 92/2009 and B 1535/2008 respectively. The CID is not currently aware of any material facts in these criminal investigations that were discovered during 2008 – 2014 period that have not yet been reported to court,” the CID Director said. 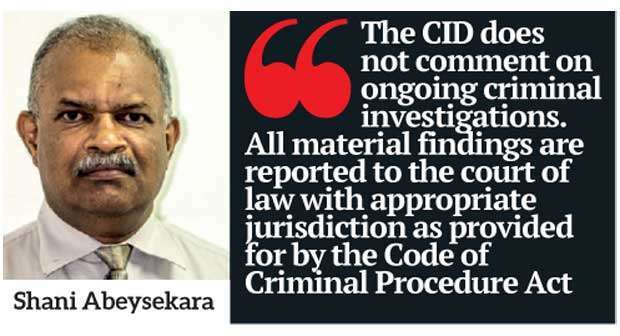 Asked specifically about the allegation by Rajapaksa that the CID is now presenting material discovered during his time and presenting it as new, Director Abeysekara declined to respond directly to Rajapaksa, but said in his statement, “Any current or former public officer with knowledge of material facts relevant to a criminal investigation has a legally binding duty to share such information with the police, who are required to record a statement to that effect and report the material to court. Even today, we urge any citizens or current and former public officers who possess such information, reports or other material that could lead to the arrest of any suspects in these cases to contact the CID and share this information in accordance with the law”. Having perused the reports filed in these cases in the Magistrate Court by the police from 2008 to date, the Daily Mirror was unable to find any indication that the findings described by the former Defence Secretary were reported to court prior to 2016, a year after the dormant investigations were reactivated by the Sirisena-Wickremasinghe Government. For his part, Rajapaksa states that he shared all the information he had with the CID when they recorded his statement last year regarding the Keith Noyahr investigation, but maintains that the police have been deliberately picking and choosing which parts of the investigation should be reported to court. “I went and gave evidence. I told them, but the issue is it is up to them. When they file a B report, they put only what they want to tell the judge. They don’t put the whole story. This is very unfair,” he charged, further alleging that the CID is instead planting accusations against him in the media. “Recently in one of the State run newspaper, an article appeared about Noyahr with a big headline, with all what the CID has given them. Now it’s not fair for the CID to do it. When the CID gives B reports to the judge, they only paint the picture that they want. The CID is there to find the culprits. They can’t first paint a picture and then try to fit all these things according to their picture. Then they will be going behind innocent people rather than getting hold of the culprits” Rajapaksa said. Last year, the CID arrested seven current and former military intelligence officers whom they accused of participating in the May 2008 abduction and assault of Keith Noyahr from outside his residence on Waidya Road in Dehiwala. 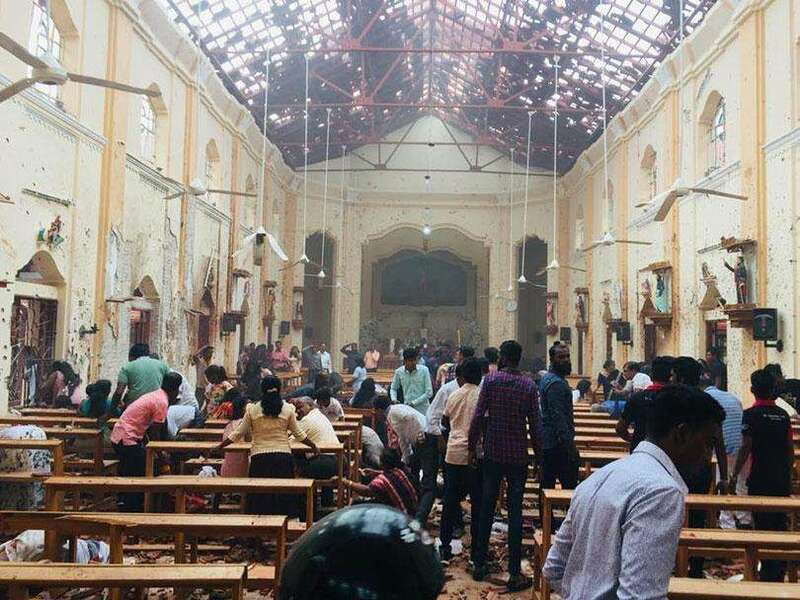 The seven suspects arrested are Major Prabath Bulathwatte, Lance Corporal Hemachandra Perera, Corporal Duminda Weeraratne, Corporal Lasantha Wimalaweera, Private Nishantha Jayatillake, Lance Corporal Nishantha Kumara and Corporal Chandrabhaya Jayasuriya. 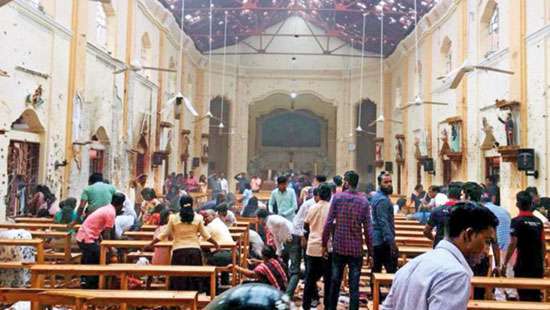 When the suspects were produced before the Mount Lavinia Magistrate Court, the CID submitted a report detailing telephone tower records and calls that implicated them in surveilling Noyahr for several hours as he moved through Colombo. They later abducted him and transported him to a safe house in Dompe. The CID later reported that they had located the safe house, and produced a rental agreement signed by two military intelligence officers who served under the first suspect, Major Bulathwatte. Though former Defence Secretary Rajapaksa could not recall whether the evidence gathered during his term in office directly implicated Major Bulathwatte’s team, he referred questions on specifics to his Chief of National Intelligence Kapila Hendawitharana. According to Rajapaksa, the heads of each intelligence agency were asked to investigate all attacks against journalists, including Wickrematunge and Noyhar, and they regularly briefed him and Hendawitharana on their evidence and conclusions at the weekly intelligence meetings at the Ministry of Defence. The former Defence Secretary recalled in particular getting briefings from former DIG Chandra Wakishta, who headed the Terrorist Investigation Division and the State Intelligence Service, the then CID leadership and former Chief of National Intelligence, retired Maj Gen Kapila Hendawitharana. “Every Tuesday we had that meeting so they came out with what they had found,” Rajapaksa said. Former Chief of National Intelligence Hendawitharana, however, told the Daily Mirror that he vividly recalls the Defence Secretary ordering all the intelligence agencies to investigate these crimes, and that they regularly reported their progress to both the Defence Secretary and him. “I remember the heads of CID, TID, SIS and DMI definitely attended these meetings,” the former National Intelligence chief recalled adding “The armed forces chiefs may have also been present.” While Hendawitharana could not recall the conclusions reached following these investigations, Rajapaksa was unequivocal on where the blame lay, according to the reports received from intelligence agencies. “I knew, definitely, that Sarath Fonseka was behind these crimes,” the former Defence Secretary charged, pointing the finger unequivocally at the former Army Commander. According to Rajapaksa, despite he knew that the former Army Commander was behind these incidents, he still allowed the CID to obtain the correct evidence and conduct investigations. According to Rajapaksa the reason he did not take action, is that as the Secretary of Defence, he did not want to gain political advantage over it. Responding to Rajapaksa’ charge, former Army Commander Sarath Fonseka told the Daily Mirror that anyone in the country knows that if the Rajapaksa Government had any evidence implicating him in any of these attacks on journalists, he would have been dragged to the prison in chains after the January 2010 presidential elections, by the Defence Secretary without sparing a thought to the criminal justice system, for no other reason than to fulfill a political vendetta. “If Gotabaya Rajapaksa is a self-respecting person, he should come out and reveal the truth and make available the information he has to the CID instead of levelling wild accusations against me in the media,” Fonseka said. “When the police are closing in on him this is what he does. Rather than defending himself, he sends his lawyers running to the Supreme Court to get rulings preventing him from being arrested. The day I am accused, I will defend myself like a lion, not like a coward,” Fonseka asserted. Hendawitharana, however, while agreeing with Rajapaksa that the evidence available at present implicates the former Army Commander, does not recall reaching any such conclusions as the investigations were not completed during his tenure in office. 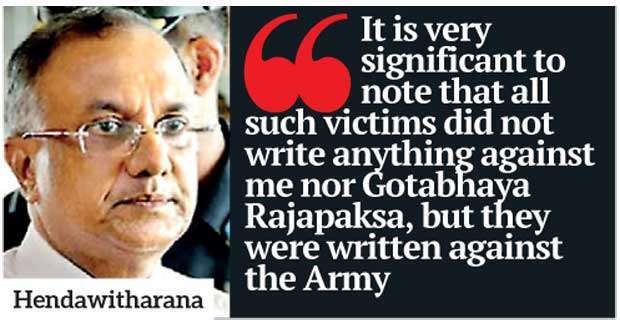 “It is very significant to note that all such victims did not write anything against me nor Gotabaya Rajapaksa, but they were written against the Army. It is very obvious that the Army Commander has to take the responsibility for the attacks if army troops were involved. Further I did not have any command nor responsibility over army troops,” Hendawitharana added. 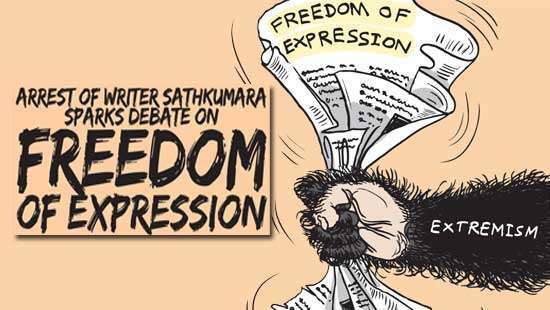 When questioned what the motive was behind ordering these attacks on journalists such as Wickrematunge and Noyahr, Hendawitharana asserted that such victims did not write anything against him nor Rajapaksa (Gotabaya), but did write against the army. In fact, the former Defence Secretary was in the middle of a bitter legal dispute with Lasantha Wickrematunge at the time the latter was killed. The dispute was over a civil defamation case filed by Rajapaksa against the slain editor in the Mount Lavinia District Court in 2008 over articles written alleging impropriety in the 2006 MiG Deal, which is currently under investigation by the Financial Crime Investigation Division (FCID). After Wickrematunge was murdered, the ownership of the newspaper changed hands and The Sunday Leader admitted fault, apologized to Rajapaksa and settled the suit. Former Defence Secretary, for his part, points out that each time he was accused of threatening a journalist, his actions had been prompted by complaints he had received from then army commander Sarath Fonseka, who he said was used to complain to him about journalists writing against the army. The former Defence Secretary was referring to accusations that he had made a death threat over the telephone to former daily newspaper Editor in 2007, and later personally threatened Lake House journalists Poddala Jayantha and Sanath Balasooriya with death after summoning them to his office at the Ministry of Defence. In the latter instance, Rajapaksa insisted that Sarath Fonseka had complained to him that these journalists were protesting against the army. However, Field Marshal Sarath Fonseka, speaking to the Daily Mirror , strenuously denies charges that he had any involvement in these attacks or threats. Field Marshal Fonseka took specific issue with the accusation levelled in a recent column in The Island newspaper that his motivation to attack Noyahr may have been an article written in The Nation titled ‘An Army is not its Commander’s Private fiefdom’. “What Keith Noyahr had stated in his column, that the army is not its commander’s private fiefdom is exactly right,” Fonseka said. “It was Mahinda Rajapaksa and his younger brother Gotabaya Rajapaksa who believed that the forces are their private fiefdoms and had constant disputes with journalists, but no one else,” said the former army commander. Fonseka specifically charged that the weekly intelligence meeting referenced by Rajapaksa was used to supervise all intelligence operations in and around Colombo from the Ministry of Defence, through a separate chain of command packed with loyalists, bypassing the normal organizational structures of the three armed forces and the police. According to the former army commander, it is through this group and even with former LTTE cadres that the Rajapaksas formed a faction to plan high profile assaults, abductions and murders of media personalities and others under the auspices of the targets being a threat to national security. 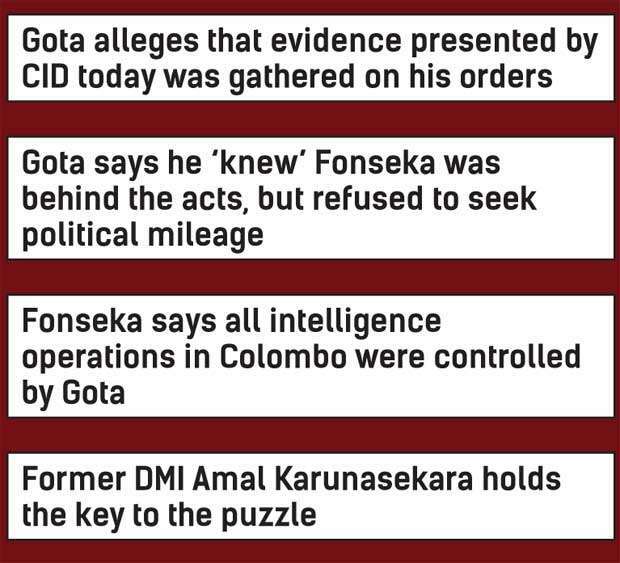 “Although military intelligence came directly under the army commander, the Defence Secretary handled the Colombo intelligence operations unofficially from the Defence Ministry. They were involved in various unscrupulous activities including the white van culture,” Fonseka said. For his part, Rajapaksa points out that to accuse him or his Chief of National Intelligence of having any command responsibility over any military or intelligence unit is ludicrous. “The Army has infantry regiments such as the Singha Regiment or Gajaba Regiment, engineering Regiments, and other specialized units. The Army intelligence regiment is just one other such regiment. How can anyone say that an Army Commander doesn’t have control over the intelligence regiment? Then can they say they don’t have control over the Singha Regiment also?” Rajapaksa argued. The Daily Mirror reached out to the Army to resolve the dilemma posed by the disagreement between the country’s two top wartime defence officials. However, army spokesman Brigadier Sumith Attapattu told the Daily Mirror that the Army is unable to officially clarify what the correct position is regarding the command responsibility for military intelligence officers in Colombo vis-à-vis former Defence Secretary Gotabaya Rajapaksa and Army Commander Sarath Fonseka during this period, saying it is a complex and controversial issue. When asked about the degree of command responsibility that could be attributed to Secretary Rajapaksa and CNI Hendawitharana, Field Marshal Fonseka told the that the former officials could not have it both ways. “If they claim that they have no responsibility for what the troops did, why do they claim that the war was won by them?” he opined. He alleged that after the 2010 Presidential Election, the TID arrested 17 military intelligence officers and tried to force them to make false confessions that they had killed Wickrematunge on his orders, releasing them only months after these efforts failed to pan out. Last month, the CID arrested the former Director of Military Intelligence (DMI), Maj Gen Amal Karunasekara, who was named the 8th suspect in the Keith Noyahr abduction case. 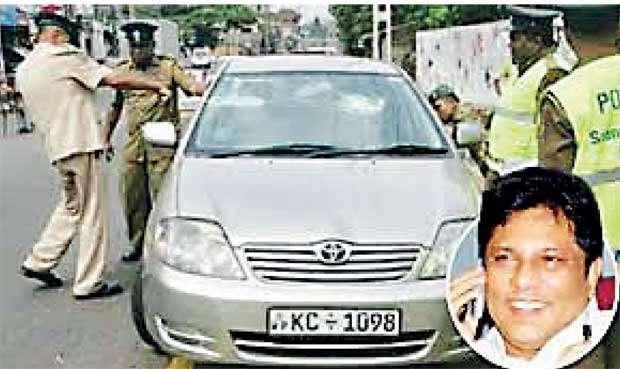 It was this arrest that has sparked the trade of charges between the former Defence Secretary and the Army Commander as to who had given orders to Karunasekara, who is accused by the CID of having coordinated the abduction of Noyahr. This abduction is alleged to have been carried out by Major Bulathwatte’s platoon of military intelligence officers. Rajapaksa points to the Army chain of command and the official procedures in place in his defence, whilst the former Army Commander points to the unofficial command structures, procedures and murky world of intelligence that he says existed during the height of the war. According to Rajapaksa, the CID is choosing to follow Fonseka’s interpretation in the face of all available documentary evidence. The CID’s arrest of former Director Military Intelligence (DMI) Amal Karunasekara was sparked by his telephone contact with the alleged abductors while they had Noyahr in custody at Baduwatte Wallauwa, a safe house in Dompe, as well as the statement a former military intelligence officer turned state witness had given to the CID that the rent and upkeep for the safe house was allegedly paid for by Karunasekara in his official capacity as DMI. According to Rajapaksa, upon being told of Noyahr’s abduction by the former Nation Editor Lalith Allahakkoon, he had immediately contacted DIG Jayantha Wickremaratne and Chief of National Intelligence Kapila Hendawithara to order them to begin an investigation. He says that these calls, which amount to him doing his duty when informed of a crime, are now being used to frame him with culpability. Regarding the murder of Wickrematunge, Rajapaksa too recalled a specific breakthrough on the telephone numbers used in the crime which, according to him, the CID has yet to act on. “During our time, the CID found a corporal who had influenced a Tamil person to get the SIM cards. They found that person was a corporal from the military intelligence. When he was in custody a Fundamental Rights (FR) application was filed and he (suspect) got released. It was Mr. JC Weliamuna that appeared for the suspect and obtained bail,” Rajapaksa claimed. The former Defence Secretary was referring to Military Intelligence Lance Corporal Kandegedera Piyawansa, who was arrested by the TID in February 2010, based on a statement recorded by the CID in January 2010 from a motor mechanic in Nuwara Eliya- Pitchai Jesudasan implicating Piyawansa in the purchase of SIM cards that were used during Wickrematunge murder. Piyawansa was a member of the Military Intelligence team led by Major Bulathwatte, who was arrested in connection with the Keith Noyahr abduction. “They didn’t pursue that line at all,” Rajapaksa alleged. However Piyawansa was awarded a promotion to corporal while in remand custody after his 2010 arrest, and the army continued paying his salary in violation of establishment procedures. The CID also discovered in 2016 that Piyawansa had been granted several loans from the army while he was in custody. Piyawansa was granted relief by the Supreme Court last year in the form of an order that TID Inspector Bogamuwa pays him Rs. 100,000 for violating his fundamental rights according to the court submissions by the CID. The CID has charged in court, in oral submissions made in both Noyahr and Wickrematunge investigations that the former regime deliberately botched the investigation into Piyawansa’s role and protected him from facing a serious inquiry. Reports filed by the CID in the Mount Lavinia Magistrate Court, however, reveal that sleuths conducted a wide-ranging investigation into the circumstances of Piyawansa’s arrest in 2016, which led to the discovery of his promotions and financial concessions received from the Army whilst in remand which included the payment of his salary. Despite all these there was a failure to interdict him. Instead he was granted multiple loans on concessionary terms, none of which had been brought to the Army’s attention prior to the CID investigation. In a series of oral submissions supported by written reports to the Mount Lavinia Magistrate Court, the CID has taken up the position that the platoon led by Major Bulathwatte acted under the auspices of the Ministry of Defence, bypassing the Army chain of command, as suggested by Sarath Fonseka. The officer on the ground, who was responsible for several of these investigations in 2010, was retired DIG Chandra Wakishta, who was in charge of both the TID and SIS in 2010. Speaking to the Daily Mirror from Germany, Wakishta verified that one year after the murder of Wickrematunge, the Defence Secretary had wanted the TID to take over the investigation jointly with the CID. 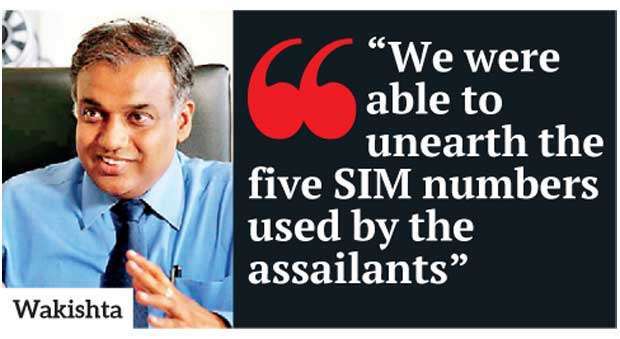 “We were able to unearth the five SIM numbers used by the assailants and these phones had been topped up from a place in front of the Tripoli Military Intelligence Camp in Maradana,” recalled DIG Wakishta while concluding that they had obtained information that Fonseka was behind Wickrematunge’s attack. 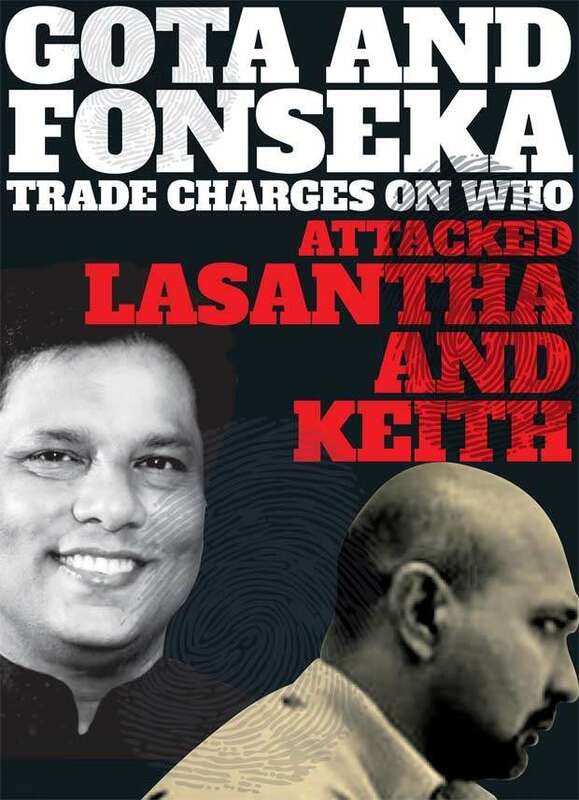 Asked why the TID then failed to question Fonseka if this was the case, Wakishta replied that while his presumption is that these attacks had been carried out by the Army, he was unable to gather enough evidence to justify questioning Fonseka in 2010. Wakishta stressed that the TID was planning to make a breakthrough in the Wickrematunge and Noyahr cases based on information that they were jointly carried out by the Kohuwala team, but they never gathered sufficient evidence to proceed from there onwards. “We questioned former DMI Amal Karunasekara, who is now in remand custody, to obtain details for a breakthrough, but he did not cooperate with us,” Wakishta added. Wakista says that a place near the Tripoli Intelligence Camp, where Wickrematunge’s assailants had reloaded their prepaid SIM cards, is the same camp in which Major Bulathwatte’s team including Corporal Piyawansa belonged. However the police failed to investigate this team nor question Bulatwatte until the change in Government. All current and former police, defence and military officers contacted by the Daily Mirror in connection with these investigations agree on only one point that the murder of Wickrematunge and the abduction of Noyahr were carried out by Army intelligence personnel. Beyond that point, the public will have to wait for the CID and the courts to decide on which of the denials by our former Defence Secretary and former Army Commander is the more credible, based on the evidence and testimony available now. If SF was behind these crimes, Gota would have definitely investigated and punished SF. MR would not have missed such an opportunity. Therefoe we should not believe Gota. Oh Yes!! They would have shamelessly dragged and nailed the fella!!! "Having perused the reports filed in these cases in the Magistrate Court by the police from 2008 to date, the Daily Mirror was unable to find any indication that the findings described by the former Defence Secretary were reported to court prior to 2016, a year after the dormant investigations were reactivated by the Sirisena-Wickremasinghe Government." so Gota is lying.